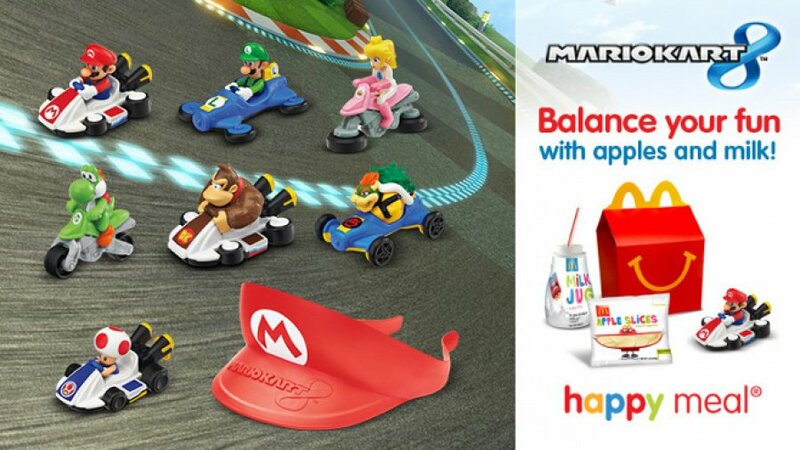 Not too long ago we brought you the news that Mario Kart 8 toys were coming to McDonald's Happy Meals in the US, predicting an early July arrival. Well, they're now available, and looking rather charming. As reported before and as the image above shows, there are seven toys to collect in addition to a Mario visor, and they'll be compatible with the McPlay Power app, too. The Happy Meal box is also heavily branded for Mario Kart 8, making this some pretty useful advertising in the huge US market. You can see a commercial for these below. Are you a young gamer planning to collect these, a parent, or perhaps a grown up that'll try and grab them without the luxury of offspring as an excuse? Let us know. And here I was thinking I didn't need to go to McD's today. Remember, most of the locations will let you buy the toy only, just ask. It's like a buck or so. FINALLY!! The Club Nintendo platinum rewards have been revealed! D'aww I only got Mario and Luigi here in Canada. @SuperMikey No, they're not. No platinum reward options mentioned anywhere on Club Nintendo site. I'm an adult and I just proudly ordered a happy meal without the luxury of offspring as an excuse lol. ...If you know what happiness is to you, because I'm happy! @StarDust4Ever I think he was joking. McDonald's new mascot looks really, really creepy. Maybe I'll pick up toad, but the rest look very bland to me. I've bought two already. I have Mario and Luigi. Will be buying everything else next time I go to McDonald's. I tried to get one today and they almost gave me a stupid fuzzy animal of some kind instead. I left because they wouldn't let me pick out a Mario Kart one. The girls at my local McDonalds all really like me and they give me free toys~ I got Luigi today at no charge! Will probably take the boys for lunch on Monday after their first swimming lesson class. Im specifically going to request "NO TOADS!" Already picked up a Mario figurine. Between this and Amiibos, I'm going to be waist deep in plastic Nintendo crap by the end of the year. Not that I mind. I'll put some of these racers on my desk at work. My brother got Luigi today and let me have one of the stickers it came with. I didn't really see the figure that good though to be honest. @Revolution909 What's with the Toad-hate man!? The Toadster rules! I will wait for amiibo. @Azikira You were not given Luigi. Luigi chose you. I just ate-up one yesturday and got a Luigi Kart Figure with extra stickers to decorate the toy-car,and one sticker of him& mario giving eachother a "hug" which I put on my Silver Dream Team 3DSXL Edition's circle pad pro ! The meal was tasty and all this fun for only $4.25, i think i'm going back today instead of sushi lol !! I ALSO got 6 street passes via Nintendo Network when i walked into the place which i played in Mii-Plaza, then i got a spotpass notice & more street passes to play on Mario Kart 7 3DS so i was there for about an hour LOL !!! @tj3dsXL " I'm living the American's Dream" LMAO !!!! 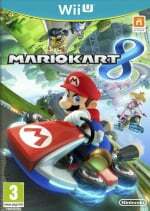 I walked into a Shell/McDonalds today in Texas, so I got to hear the coin collecting sound every time someone bought something at the gas station and there were Mario Kart toys in the McDonalds. you don't have to buy the meal. Like with Burger King you can just walk in and order a toy for 1.50 and leave. Ask the cashier which selections they have and go to town. It's not rocket science. On a few other Nintendo sites there are literally dozens of people just shouting at one another for the unhealthy food or getting a child's meal as an adult. Just order a toy. So easy. Are these things available in Canada? They aren't too bad, but are competing with beanie baby boos! Nintendo can't catch a break! I've only found Mario and Weegee so far. Nice but was really hoping for Toad or DK. These toys are a must-have, I hope I can get one tomorrow when I go shopping at Wal-Mart with my parents. Well that's if Canada even has the toys available since no one has really confirmed it.